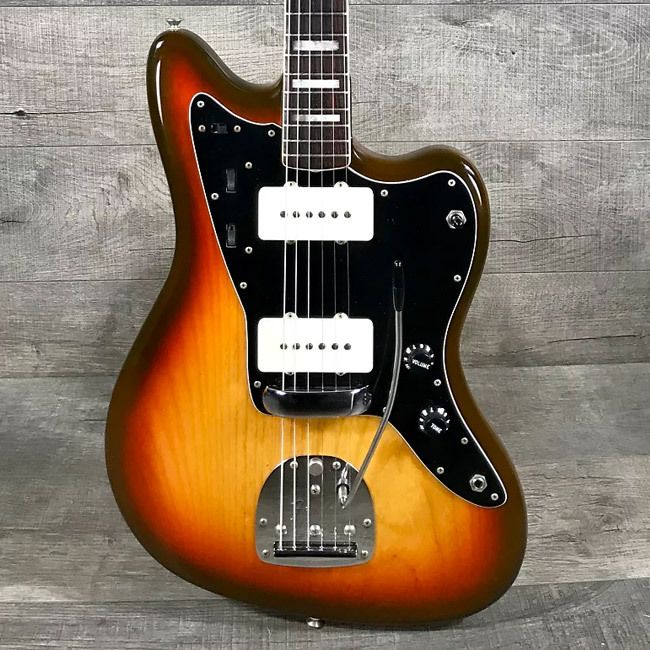 The Jazzmaster has never been a serious jazz guitar, despite the name that Fender gave it and the company's original intentions for the instrument. 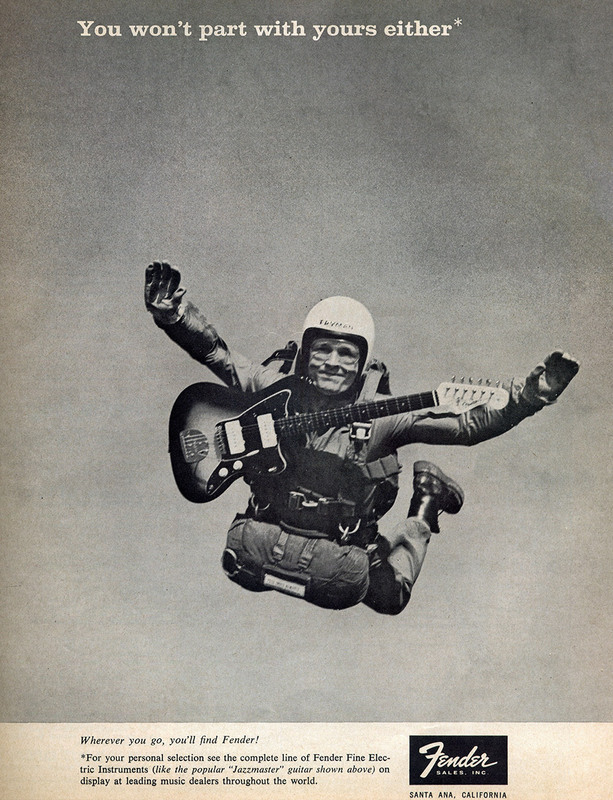 It was almost exactly 60 years ago as you read this that Fender launched the new model. If any other maker had come up with the Jazzmaster, it would be judged on its own merits and shortcomings. But it's a Fender, and so it lives in the shadow of the Strat and Tele. Inevitably, it was seen by some as an also-ran, a guitar that struggled to compete with the versatility of those two iconic models. But it does have a charm and attraction all its own. Fender had been around a little over ten years when it introduced the Jazzmaster toward the end of 1958. The ambitious new company had built a strong solidbody six-string electric line: the original Esquire and Telecaster, the relatively new Stratocaster, and the Duo-Sonic and Musicmaster student models. The Musicmaster was the cheapest, listing at $119.50 USD. The Strat, the most expensive, at $274.50 with vibrato. Despite Fender's growing success, Leo Fender, Don Randall, Forrest White, Freddie Tavares, and the rest of the team there must have looked enviously at the market leader, Gibson, whose list of electric models ran from the Les Paul Junior at $120 up to a natural-finish Super 400CES at a dizzying $700. Clearly, there were some players out there who had the money and the inclination to buy expensive electrics. The models at the high-end of Gibson's inventory were luxurious hollowbodys, aimed at and mostly played by top jazz guitarists. Fender's team decided to produce a new solidbody instrument to attract these monied musicians. The result was the Fender Jazzmaster, launched at $329.50 as the firm's top-of-the-line solidbody. Fender couldn't resist calling it "America's finest electric guitar… unequaled in performance and design features." Tavares, as usual responsible for some of the design input, said later that the idea was to make something better than the Stratocaster. The Jazzmaster had a striking body design, with a waist that had a more exaggerated offset than the Stratocaster's. 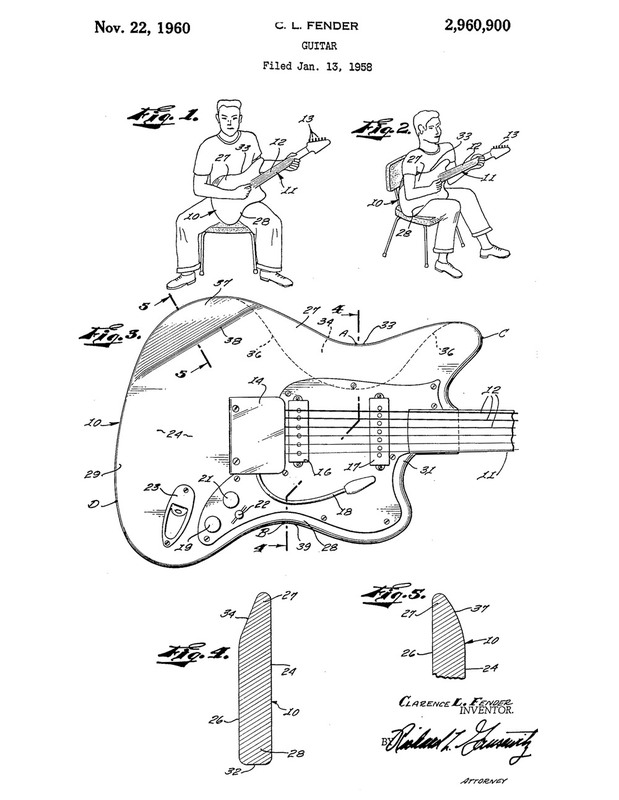 Fender applied for a utility patent for the offset body early in 1958, granted a couple of years later. 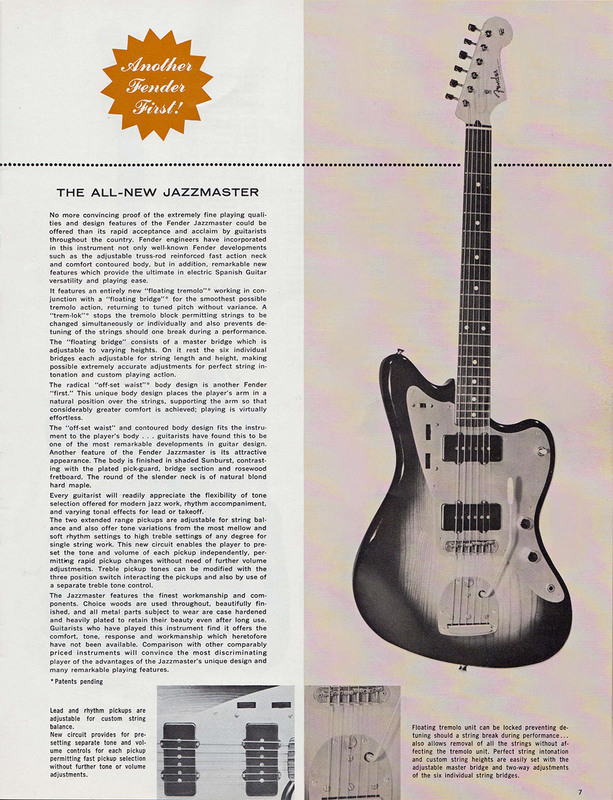 The patent was drawn up before the Jazzmaster's features were finalized, and instead it was entirely concerned with what Fender saw as the advantages the design would have for a seated guitarist, underlining the idea that the company believed the model would be taken up by jazzmen and other commonly sedate guitarists. The patent explained that regular bodies have indented "recesses or depressions" for the waist "directly opposite each other." These bodies, according to the patent, cause a seated guitarist "to be relatively uncomfortable during playing, and result in awkwardness and difficulty in achieving the proper and desired plucking or picking positions." The patent claimed the new design, in which the bass-side depression is "between three and six inches nearer" the headstock than the treble-side depression, had "a novel combination of recesses and beveled portions, thereby promoting ease and facility of playing with minimum discomfort to the guitarist." Fender also applied for a simple design patent for the overall look of the Jazzmaster later in '58, which was granted the following year. There were more Fender firsts on the new Jazzmaster beyond the body shape. It had a separate rosewood fingerboard, glued to the customary maple neck and intended as much as anything to provide a comfortingly conventional appearance and feel for the model's targeted audience. The guitar's floating vibrato system was new, too, and had a tricky "lock-off" facility designed to prevent tuning problems if a string should break. It was quite different from the earlier integrated Strat vibrato, with the bridge separate from the tailpiece, and was the subject of yet another utility patent, applied for in '58 and granted early in '61. It did not succeed nearly as well as the Strat vibrato, though, and without attention the originals can be buzzy beasts. The Jazzmaster had a pair of new pickups, too. They were based on Strat pickups, with six alnico polepieces within the coil, but the coil itself was wider and shallower, in the process generating a smooth, thicker sound—still quite cutting at the bridge but suitably jazzy at the neck. The controls were elaborate for the time, designed so that the player, jazz-inclined or otherwise, could set up a rhythm sound and a lead sound, and then flick a small slide-switch to choose one or the other. However, the system seemed complicated to anyone brought up on straightforward volume and tone controls—in other words, more or less everyone. That dual-circuit idea was adapted from a layout that Forrest White had devised back in the '40s, before he joined Fender. He saw the pioneering electric guitarist Alvino Rey at a gig in Ohio struggling to change from rhythm to lead. Later, Rey visited the Fender factory, and White told him they might have a solution. "So Leo brought the Jazzmaster out," White told me, "and that guitar was the first where you could switch between rhythm and lead. Leo was trying to get more of a jazz sound than the high, piercing Telecaster sound." In fact, jazz guitarists found little appeal in this new, rather awkward solidbody guitar, and mainstream Fender fans largely stayed with their Strats and Teles. Bob Bogle in The Ventures played a Jazzmaster for a while in the early '60s, and a few surfers, including The Surfaris of "Wipe Out" fame, seemed to like the way you could switch from snap to smooth with the presets. The accomplished American instrumentalist Roy Lanham favored a Jazzmaster for a while, too, but at the time about the only full-on jazzers who indulged the new Fender were Joe Pass and the lesser-known Eddie Duran, although both proved to be brief flirtations. Jazzmen kept hold of their hollowbody electrics, and Fender had to come to terms with what must have seemed like its first misstep. Roy Lanham - "Lover Come Back To Me"
The Jazzmaster's offset body influenced the look of a few other Fender models that followed, including the Jazz Bass (1960), the VI (1961), the Jaguar (1962), and the Electric XII (1965). The Jazzmaster itself went through a few cosmetic changes. Its pickguard was at first one of Fender's gold-colored aluminum types, generally known as anodized, but in '59 these nine-screw metal guards gave way to 13-screw tortoiseshell or white plastic ones. 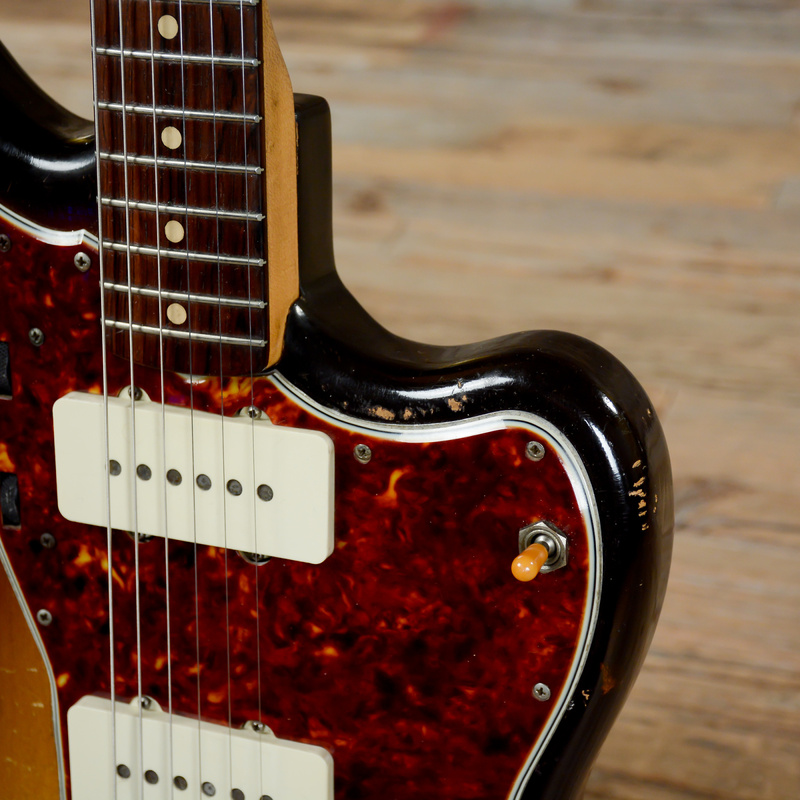 In '65, the same year that the Strat borrowed the Jazzmaster's broader headstock, the Jazzmaster gained binding to its fingerboard, and the following year block-shaped fingerboard markers replaced the original dots. The streamlined offset shape of the Jazzmaster seemed to benefit particularly well from one of Fender's custom colors, which added a gleaming throb of color to an already cool object. The arresting delights of fiesta red, lake placid blue metallic, teal green, shoreline gold metallic, and the rest seemed well suited to a Jazzmaster—and didn't cost much. In 1963, for example, a color finish would add just $17.47 extra to the list price of a regular $349.50 sunburst. Which, on reflection today, you might call a good investment. During the '70s, Fender's new CBS management cut back the existing lines and offered few new models. 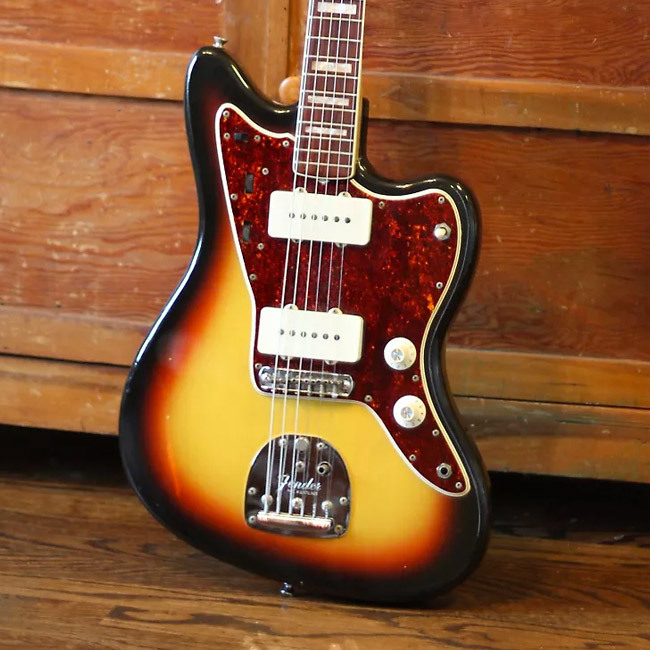 The Jazzmaster—by now boasting a black pickguard—disappeared from the catalogue and was phased out of production by 1980, not returning for another six years or so. Boardroom doubts in California coincided with a new popularity among up-and-coming guitarists for the Jazzmaster and other Fenders considered by some as second-rank models. Part of this was due to the punk ethic of being seen (at least in theory) to have little cash. Jazzmasters were relatively unloved and so relatively cheap on the secondhand market compared to the burgeoning prices of what were now being tagged as "vintage" Strats and Teles. One of the best of the new breed was Tom Verlaine, who in the New York group Television played a Jazzmaster and showed its versatility on 1977's Marquee Moon album. In Britain, it was necessary to listen no further than Robert Smith in The Cure and Elvis Costello fronting The Attractions, both of whom selected a Jazzmaster as their six-string of choice. Since then the Jazzmaster's reputation has waxed and waned, reissues have come and gone, improvements have been made, and a select bunch of guitarists continue to discover its particular allure. 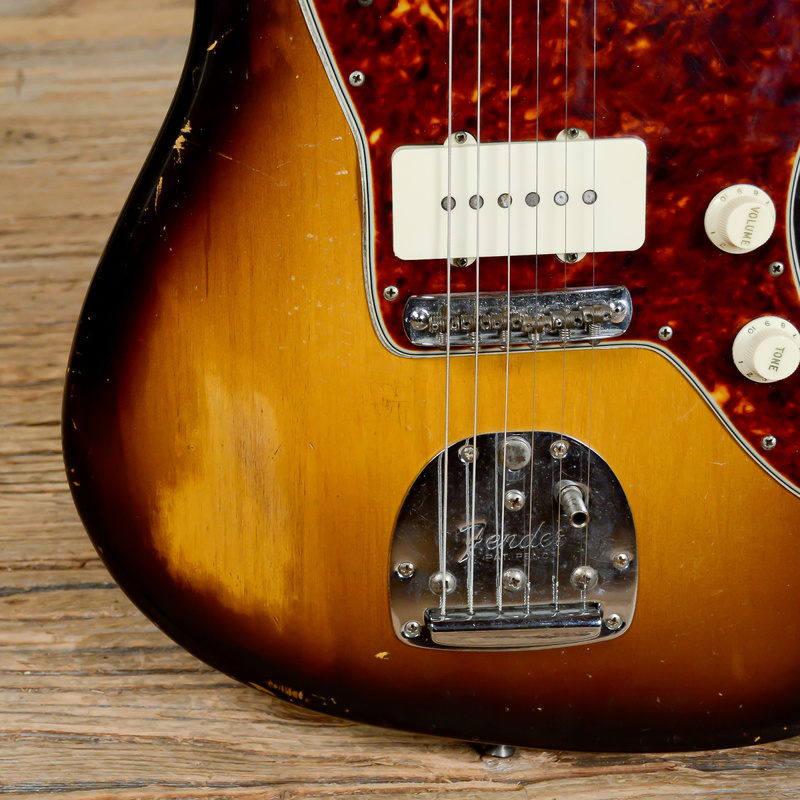 Sonic Youth, Dinosaur Jr., My Bloody Valentine, and more sparked a '90s revival that continues to this day, making the Jazzmaster one of the most popular choices in some indie circles. Fender revived the Offset description a few years back as a family name for many of its wonky-body models, and the look has inspired other makers to re-evaluate this 60-year-old design. As Justin Norvell at Fender puts it: "The big trend now, which has been taking years to bubble up to the surface, is the general acceptance of the Jazzmaster as not a quirky model but a legitimate platform." About the Author: Tony Bacon writes about musical instruments, musicians, and music. He is a co-founder of Backbeat UK and Jawbone Press. His books include The Fender Electric Guitar Book, The Bass Book, and Electric Guitars: Design & Invention. His latest is a new edition of Electric Guitars: The Illustrated Encyclopedia. Tony lives in Bristol, England. More info at tonybacon.co.uk.